AS WORK on the construction of the new river crossing nears completion, one of our local residents has come up with an interesting plan for the road network that joins the bridge. Doug Myers, of Walton Lane, Weybridge, a long-time resident of the area (and the man who produced all those wonderful paintings of the bridges across the Thames that I’ve featured in this column before) reckons that the most sensible way to re-arrange the roads around the new bridge is simply to block off access to Walton Lane alongside Cowey Sale altogether. Doug says: “This area could be returned to the safe recreation spot as it was in the 50s and not a busy spaghetti junction. Walton Lane from Weybridge would not be connected to the bridge. Historically it was not connected and this link has grown into a monster problem in many ways. 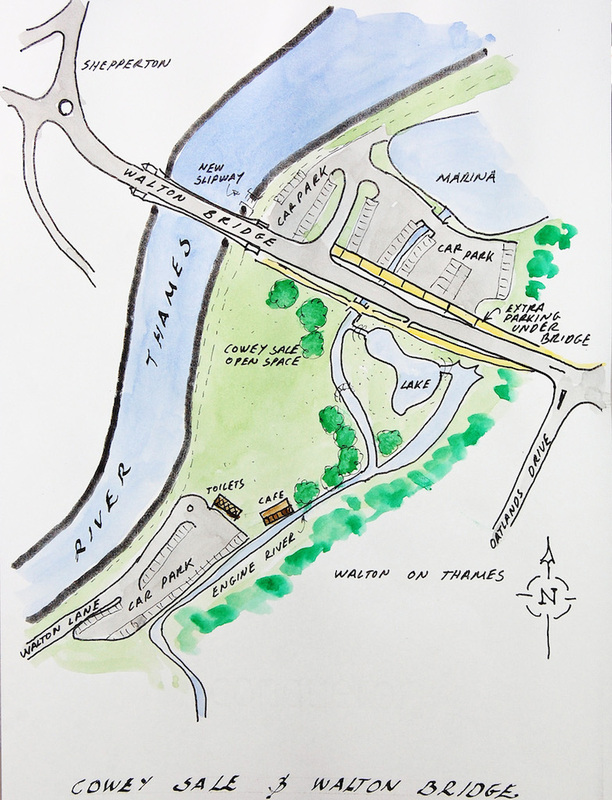 “My idea is that traffic could still have access from all directions for parking by the river. Taking things a stage further, Doug argues that Cowey Sale would be a destination not a through route. The right hand turn on the bridge coming from the direction of Shepperton would be eliminated, which would surely help through traffic and the large open of Cowey Sale itself could be a focus for fairs, carnivals and a visitors’ centre. Doug, who has set up a website to present his proposal (www.waltonlane.net) also points to the fact that in the past there was no connection between Walton Lane and the bridge. Cars would still be able to gain access to Walton Marina and the car parking by the river by turning left from the bridge and if you wanted to vist the recreational space at Cowey Sale if would simply mean approaching by car from the Weybridge end of Walton Lane. Personally, I think it’s a really interesting idea with considerable merit. LONDONDERS are being encouraged to help create a ‘swan soap opera’ this spring, by tweeting their sightings of the season’s first cygnets in the capital (#swanstory). The nationwide project, which aims to encourage interest in but also respect for, wildlife, will chart the highs and lows of one of our most loved and iconic waterway birds – the mute swan. The call comes from the Canal & River Trust – the charity that cares for 2,000 miles of waterways in England & Wales – which is chronicling the progress of swans throughout spring, summer and autumn, as they set up their nests, lay eggs and welcome their new born into the world. The initiative will report the public’s first sightings of breeding pairs, their nests and then their young, whilst the Trust’s ecologists will follow the progress of a number of breeding pairs and their cygnets through to the autumn. People can follow the project at www.canalrivertrust.org.uk/swan-story and can tweet their own updates and photos using #swanstory.